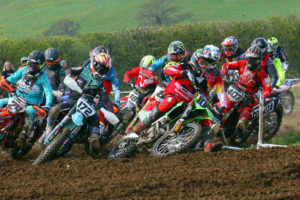 For the 2nd year running Enduroland’s annual Scramble race was blessed with fabulous weather, and was without doubt the most fun event of the year for the club, with it running like clockwork and providing ‘fast and furious’ non stop action. This year there was an added twist with over £3000 in prize entries, and with rider entries up on last year the future looks bright for this awesome event. The day started with the kids/youth practice and most of the young guns enjoyed 2 laps of the track to learn lines and plan race strategies with the Adults following with the same. The 8 race format never seems like it offers much bike time but ask any racer there if it’s enough ……..the answer would be a big yes! Just to make sure a further hour fun/practice was tagged on at the end with not taking up this option having already ridden loads during the day. This will now be the format for the 2018 event. Race one got underway at bang on 10.30am with minute intervals splitting the subsequent start grids, which were set out as Clubman plus/Experts and Clubman followed by Vets, then Masters with twinshock/classic bike support, Sportsman/Novice and youth, and finally a group of absolutely race mad kids/youth that had to have a two minute gap from the Adult Sportsman/Novices from race 2 due to being a tad too fast! Race finish orders soon started taking shape with Tim Hammond and Aaron Bloomfield head to head for the whole day. Tim eventually taking the overall win in Clubman plus /Experts and Aaron sustaining an injury in race 7. It was great fun to watch these two heading towards the last jump and obstacles in every round. Jake Szabo had a good day in 3rd. James Dover took a well deserved overall win in the Clubman class showing a disciplined 8 races with no issues apart from one close call, so well done James. Rich Summerbell was 2nd with William Wilson 3rd. In the Vets, Kev Freeman took a stunning 8 wins from 8 starts with Tom Griffiths 2nd and James Cross in 3rd. The Masters was mastered by Chris Day in 1st, Mick Belcher took 2nd and Antony Heatley 3rd. The twinshock/classic looks set to grow hopefully and Richard Sharpe took the win and maximum points with Alex Meek in 2nd and John Morrison in 3rd. The Youth class was dominated by Chris Bailey with 8 wins from 8 and 8 holeshots followed by Reilly Dennison holding his own and William Gorringe in 3rd. Nick Brashall maxed the Sportsman class with 8 wins from 8 and Alex Dennison took 2nd followed by Jordon ‘just eat” Saunders in 3rd. In the 85cc BW a jet lagged John Stanley took 8 from 8 with Flynn Dennison in 2nd and Kit Szabo in 3rd. The 85cc SW saw ‘one to watch’ Henry Life not only take 8 from 8 but also the overall with Carter Brown 2nd and Jayden Westcott in 3rd . The 65cc class another new name to the club Harvey Antrobus took a stunning 8 wins from 8 starts with Chris Meek in 2nd and Fenton Webster in 3rd . and three free entries to the events of his choice. Enduroland owner Nigel Wheatley said of the event “Absolutely the most fun event we run with a great bunch of guys that ran like clockwork -it can only grow now with next year’s date set at 28th October 2018 and the prize entry fund once again at well once very £3000. To dizzychoonz for the fantastic turn around of both the event photos and a superb video. Thank you choonzy. Not forgetting our fabulous farmer Fred for the land”.